Like the average person I am, I often imagine my dream garage to be covered in car memorabilia and pieces of race cars that have been cut off and resold to me at higher prices then I’d like to pay. You know, accessible stuff. But this whole thing about hanging entire cars on walls... well, it’s growing on me, a little. “A little” is key there. It’s not growing on me a lot, just a little, although that’s usually what people say in feeble attempts to claw their way back up from the beginnings of a downhill slide into weird obsessions. Not this time, wall cars. I’m strong. But this BMW M1 makes a good case for them, depending on how you look at it. (Head tilted sideways is a good start.) 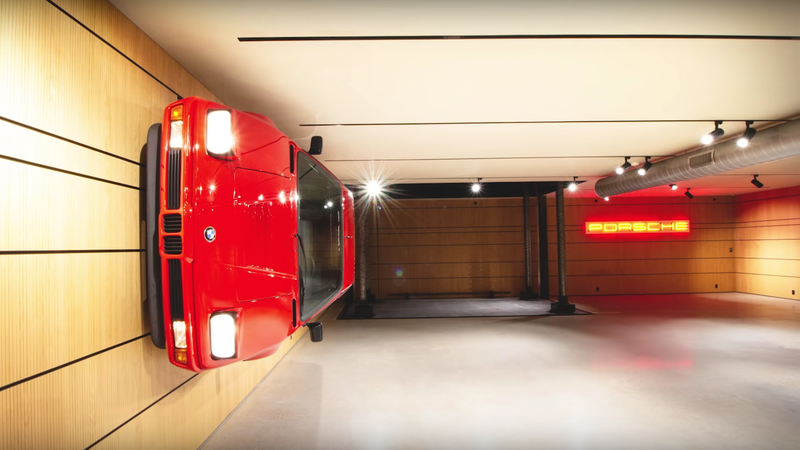 Its owner posted the story of how a car that was BMW’s one true attempt at a supercar became an art installation on a wall in his garage on Bring a Trailer, as found by Motor1—basically, the owner already had two road-going M1s and bought a wrecked one for a parts stash. At first I thought to merge the two into a working automobile but then it occurred to me that things can be done to a wreck (or a pair of wrecks) that would be borderline criminal to do to a working, running car. With the beauty of the engine-on-a-stand in mind I decided to turn the two wrecks into an art display. A lightweight aluminum frame was built to mount the body panels and make it appear as a complete car [including the interior – BaT], ready to step into and drive away. The exterior of this ‘car’ was given show-quality paint in the original red hue. The M1 art display went into the sub-level of the owner’s three-story garage, according to the YouTube description on the installation video, so who knows what kind of wild stuff is on the upper levels. I, at least, know this: I wasn’t into this wall-car stuff when I saw the Pagani Zonda room divider in an $8 million Miami condo earlier this summer. Perhaps that was because Paganis freak me out, or perhaps that was because I have a believe that cars are better positioned on the ground than sideways in the air. But this M1 is nice. It’s flat enough that it doesn’t scream “Look at me bulging out from the wall!” and it compliments this room nicely. If I stare at it too long, though, I begin to remember how much a sideways car disorients my reality. I also begin to think it makes the room look a little heavy on one side, but, you know, object placing is trivial in comparison to perceptions of reality. Still, it makes a convincing case for wall cars. I think I’ll still stick to my modest use of sawed-off pieces of race cars if I have a giant garage to fill one day, but perhaps I’m not aiming high enough with my dreams.